This market is considered to be the best flea market in Victoria. It opens only on Sunday and it is a fantastic place to be in, if you are looking for some articles at a cheaper rate. All the vendors come up with their products on this day. You will get anything starting from clothes to cosmetics here. If you are good at bargaining you can earn a lot of profit from this shop. Apart from this, you will get to eat some of the most delicious street food here. The food counters are stationed along the length of this market. Try the best Camberwell trip planner to visit this Camberwell Sunday Market as well as many others. You can add cozy hotels in Camberwell like Arrow On Swanston, City Limits Hotel Apartments and Eastern Melbourne Family House. Draft the best Camberwell vacation packages using ideal templates offered by TripHobo. Also explore how to reach Camberwell on the go! 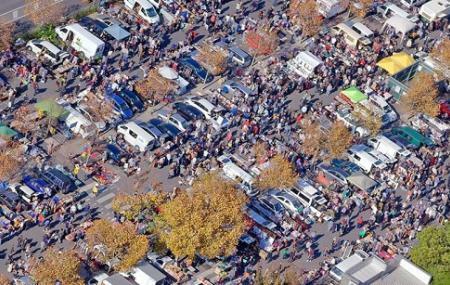 How popular is Camberwell Sunday Market? People normally also visit Hawthorn Craft Market while planning their trip to Camberwell Sunday Market. Really good variety, I love the community and how it is rarely the same, with private sellers and frequent sellers stocking new and interesting items. Entry is gold coin donation for a good cause. What I don't appreciate so much is the unregulated area in terms of smoking which means that anyone can walk through the market and smoke and e eryone has to suffer for it. Great place to visit for a coffee, food and a whole bunch of bargain hunting! After going here quite a few times...I still love it just as much! Seriously, just go and have a look around to see some funky stuff. Even if you don't buy anything, going is an experience in itself. If you like to explore the second hand of clothes and household items, you could find everything you can imagine. I love this place and I have been visited here many times.